Diwali, a festival of lights, a festival of Lakshmi and also a festival of luxe. This is also, in some cases, a celebration of vanity and ego. Small wonder, the fireworks industry in India boasts of over Rs 6,000-crore worth of annual turnover. 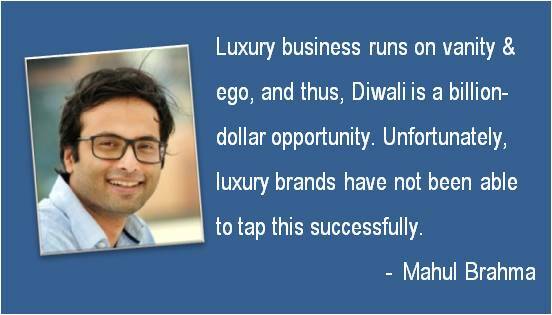 Luxury business runs on vanity and ego, and thus, Diwali is a billion-dollar opportunity for luxury brands. Unfortunately, luxury brands have not been able to tap this successfully. No, I am not asking them to make firecrackers like a Gucci rocket, may be in the future, but not now. These brands need to understand that spends during Diwali celebrations are not only on firecrackers, it is also on traditional attires and expensive gifts, among many others, which are an integral part of this special occasion. The brands need to understand that among other factors, two are critical – customisation and communication, the two Cs. First let us talk about customisation. A great example of a luxury brand which has managed to customise its products and thus tap into most of the celebrations is a Spanish brand dedicated since 1953 to the creation of art porcelain figurines, Llardo. Its Ganesh and Lakshmi figurines are one of the best-sellers and so are the Ram-Sita-Hanuman and Radha-Krishna ones. Even Hermes had launched a saree for tapping the Indian market. Llardo, however, has not been able to master the second C, Communication, and thus, in spite of the right customisation has not been able to become a household name for the Diwali celebrations in India. Llardo needs to look at the Great Indian Middle Class and choose a correct communication strategy for this untapped pool. For Hermes and its saree, it was not a success story on both the Cs and thus they never replicated the strategy, we Indians still prefer Sabyasachi or Tarun Tahiliani for such a price range. But what about the other brands such as Cartier, Prada, Gucci, Jimmy Choo, Armani and Louis Vuitton? Carve the market: Most luxury brands have their origin in some far-off locale or hamlet such as Venice or Geneva or Paris. This does create an exotic factor which helps in justifying the premium but also alienates the brands from our culture. So these brands have to come up with elements which are truly Indian and easier for us to accept in our traditions with open arms. Customisation is critical: These brands need to identify an opportunity like Diwali and create a market. Unless brands customise to suit our customs they will not be accepted in our culture. Why can’t we have a Diwali-special edition Rolex watch or Diwali Montblanc pen which is inspired by a firecracker? Both these brands have a history of customisation. Remember, Montblanc’s Mahatma Gandhi special edition pens or Rolex’s customised watch for Jawaharlal Nehru with India etched on the dial? These will be beautiful gifts and we Indians will open our coffers wide open for them. These customisations tap into the vanity and ego factor and thus price is never a deterrence. Here are some customisation ideas for luxury brands. Understanding customer mindset: Always remember we Indians are extremely price sensitive. We splurge on fire crackers because somewhere we think it is worth the money. Similarly, we will begin to accept these “foreign” brands as an integral part of our celebrations when these brands, in turn, will make it worth the buck. So brands need to identify where the customisation needs to be done and how. For example, why can’t LV come up with a fire cracker trunk? Historically, LV has customised trunks and carriers for our Maharajas, for their golf clubs, turbans, decorations, polo sticks, horseshoes, colonial helmets, among others. Louis Vuitton had, however, created Diwali-special 40 re-edited pieces using the fabric from authentic “vintage” saris, which did not take off because of wrong product choice for customisation. Jimmy Choo’s ‘Exclusive for India’ collection, consisting of handbags, clutches and silk scarves made of hand woven embroidered fabrics from India is another example of the wrong choice of products for customisation. The brand is known for its heels and that is the flaunt-factor, even with a saree. Creating a need and then placing the correct product is the fail-safe strategy. Marketing is important: Once the market is created and customisation complete, the next step is marketing. You have a fair idea of the mindset of customers, so now it will the right marketing strategy that will make the kill. That LV fire cracker trunk or Jimmy Choo’s Diwali special Lang Heels for women or Armani’s Diwali special kurtas will become a necessity through right marketing and communication. Communication is the key mantra: This is an element that can make or break your entire strategy. If your communication strategy is not in place, no matter which market you carve for yourself, no amount of customisation, nor understanding the customer or marketing can save you. A wrong communication strategy will take down the brand and a right one will make the brand richer my millions. Luxury communication is a different ballgame altogether. It is not an Amazon or Flipkart Bonanza sale and so communication has to be niche. Let us understand who is the target audience? A majority of existing luxury buyers and 30-40 per cent of new entrants who are asset rich but not convinced of the value proposition for paying the premium for a luxury good. Both these categories do not associate these brands with Indian traditions. They need to be lured with the right products and using the right media. This is where PR or media relations play a critical role. Targeting luxury magazines and TV shows with stories on how these brands have innovated and customised only for the Indian market to celebrate Diwali are a great avenue to grab attention of the potential buyers. There are also magazines for niche players such as Audi or Porsche owners where in such customisations can be communicated. Editorial still has a great pull as far as credibility is concerned so should be harnessed well. Luxury brands need to understand that communication needs to blend in, showcasing how India is an integral part of the brand’s ethos and history. This will justify the need for customisation and make them a necessity in our billion-dollar festival of lights.